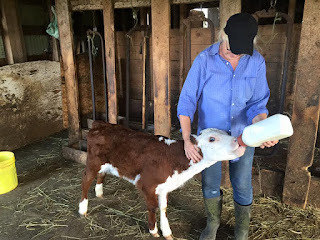 Hello there, Viv here to share with you a little bit about a day in the life of my friend, Nancy the farmer. We buy our eggs from Nancy and her husband, Earl, who have a little farm in our village, are wonderful friends and Nancy is just a fun, hard working lady. Her profile picture on Facebook is Wonderwoman, no wonder! 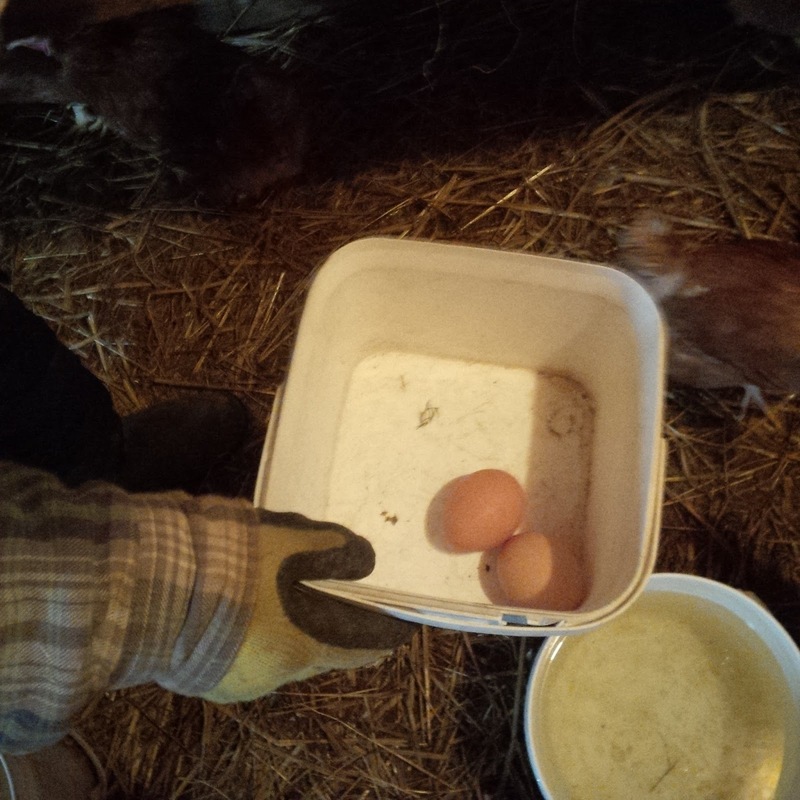 So recently on my egg buying run, it was a sunny day so I put my red and white 'wellies', as we call them in England on and announced I was ready to go to the barn. Poor Nancy was all clean in her indoor clothes and had to get her rubber boots and coat on to take me on a tour. 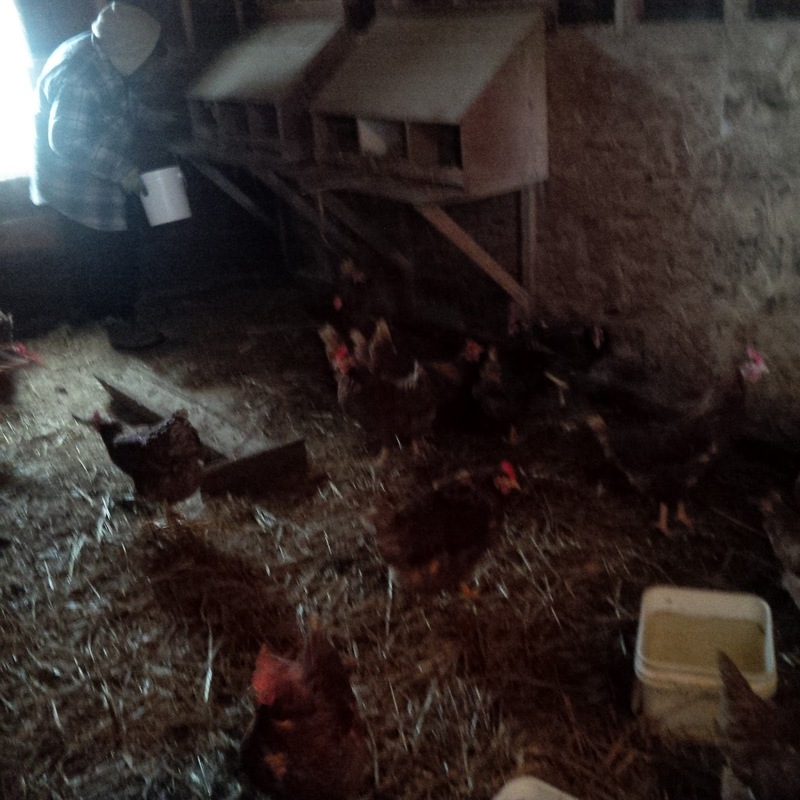 We went to see the hens first. I was taken aback by an ammonia smell being a city slicker and was soon told "That's chicken poop"! We laughed about that for a couple of days. 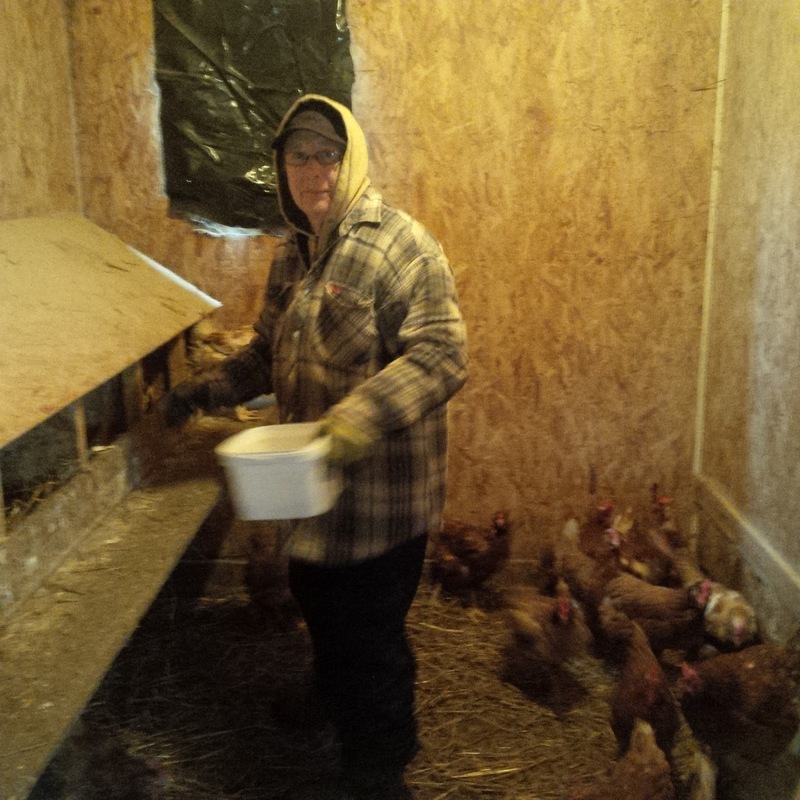 Nancy arrives in the hen house and says, "Hello ladies", then gets them some water, collects some eggs and all the while telling me where to stand, moving buckets around, filling buckets with water. This is a woman, around whom, it is almost blasphemous to stand around and do nothing. I just did as I was told and I had a blast on the hen run with Nancy! She inspires me with her work ethic, her constant sunny disposition and her dedication to her family. The first couple of eggs. Beautiful! 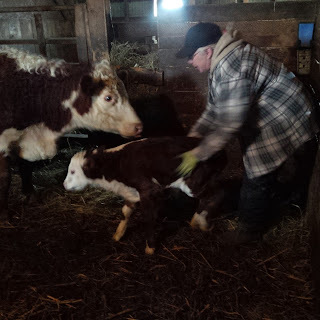 Next it was into the barn where the calves are. 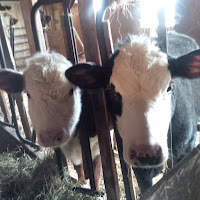 When I started research for this post there were two calves. 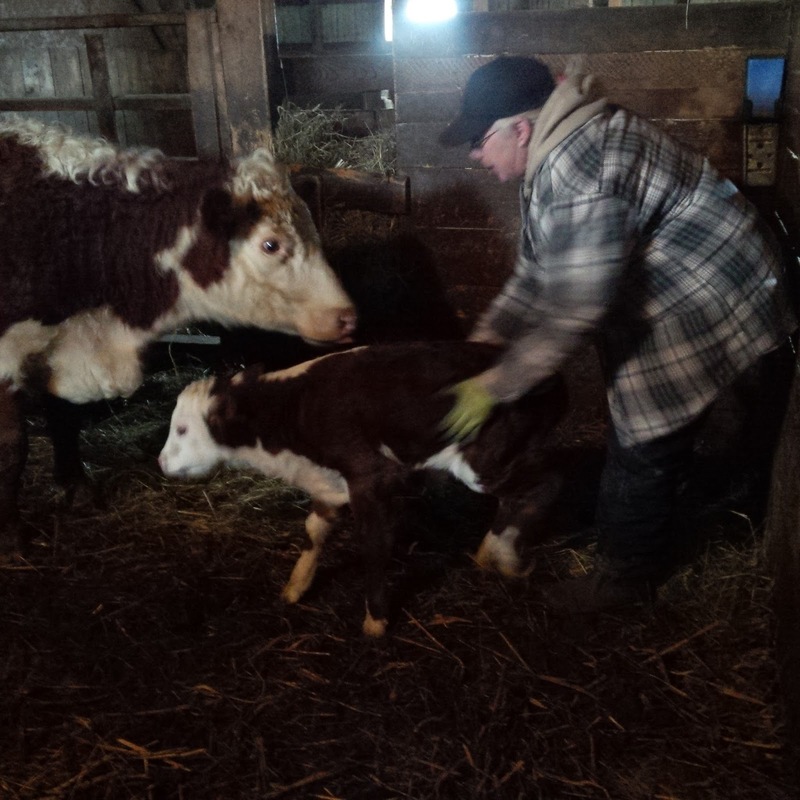 Faith is hereford, brown and white, and she now has a barn mate, black angus and hereford cross, as pretty as she is but shy around people because he wasn't hand fed like Faith was. They are now yearlings as you will see below, have such pretty eyes and they are sooooo cute. The sweetest part of this tour was meeting Bully the little bull who was only 4 days old. It was the time of day to bring the big cows in and Nancy instructed me to stand a little back from the barn entrance because they may not come in if they see me there. Isn't nature amazing? Like children, it's an instinctual thing to trust those they know and be a little leery of those they don't. Earl says she raises them because she likes them. 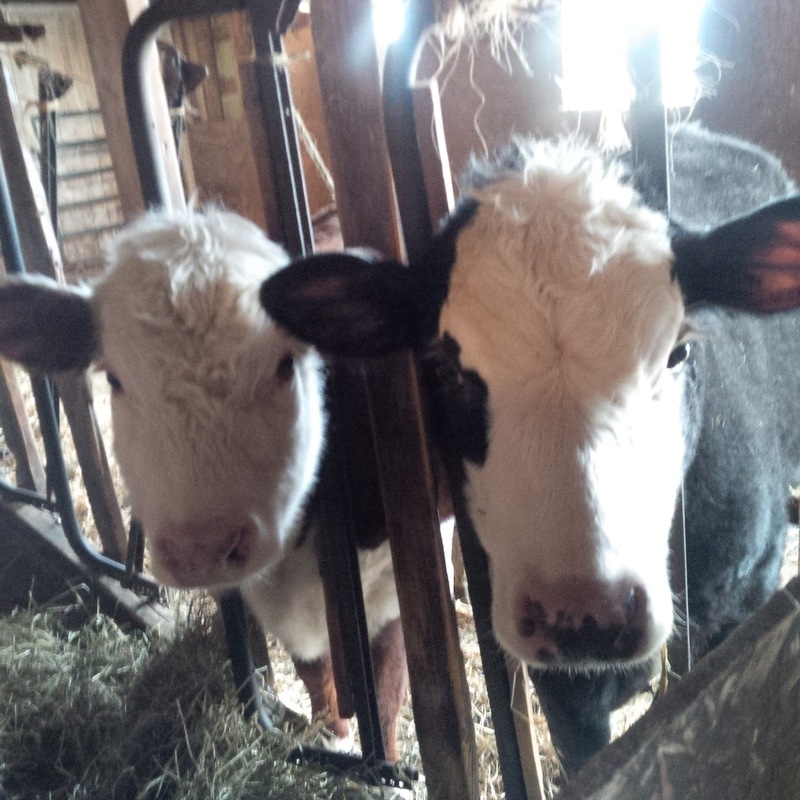 He tells me they grow from calves to yearlings and over a year, they're called feeders when they get older. Before calling the cows in, she swept away hay from their stalls. Then she forked fresh hay from a stall beyond the manger so when they come in they can feed. Water buckets are filled from a tap in the barn, kept from freezing with electrical wire and we're ready to bring in the cows. Nancy went out to the pasture gate and opened it, calling to them, "Come on in Ladies" and I'll be darned, if they didn't just all turn towards her and file in in a line. Just amazing to me. 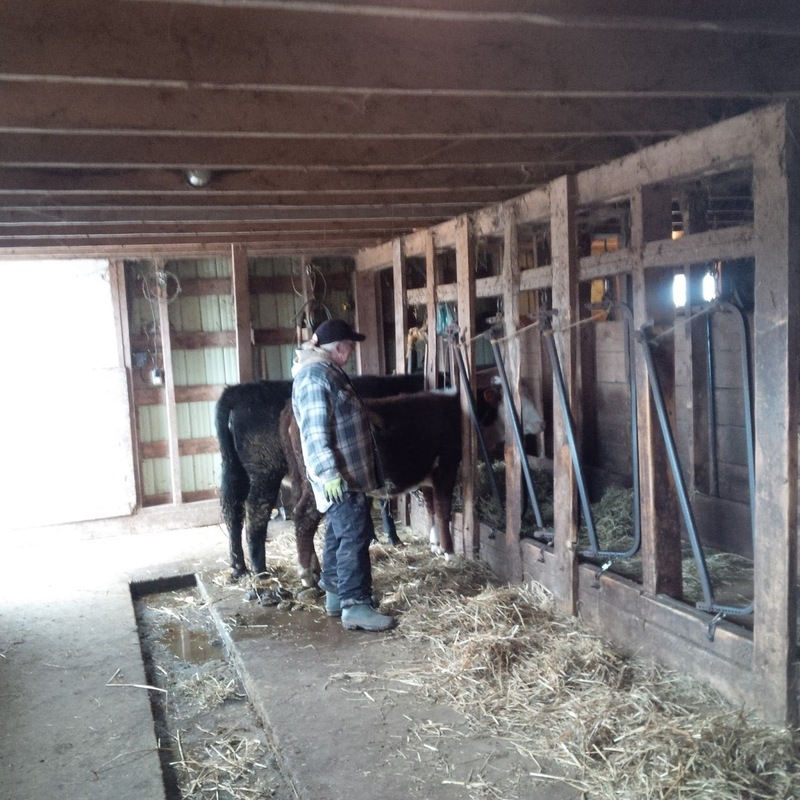 They lined up one by one in their stalls where she had raked some hay around where each would spend the night. The yearlings, happily in for the night.That is little Faith and her barn mate all grown up! 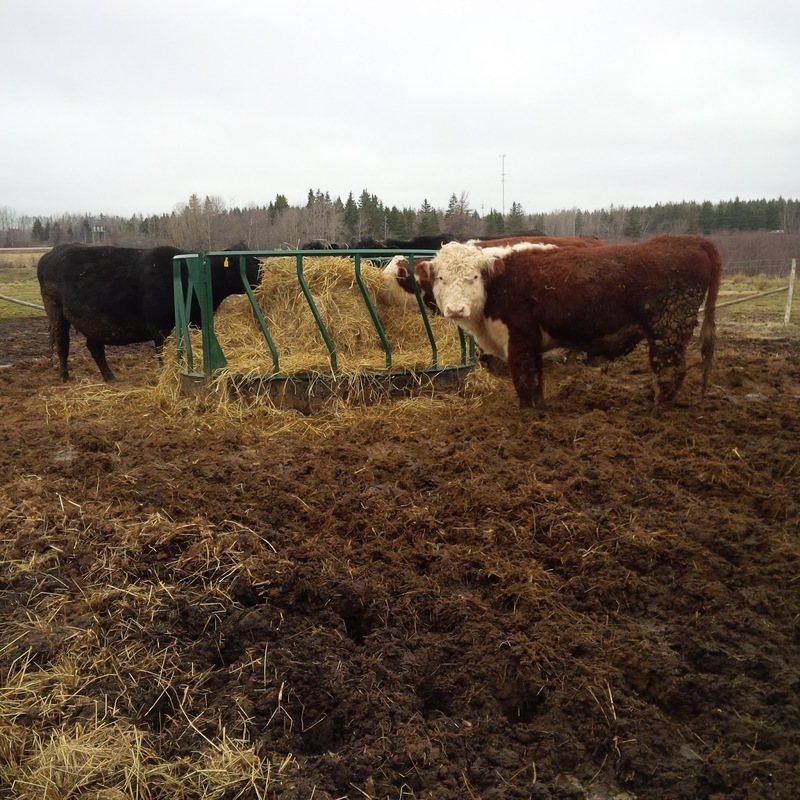 As the cows take their places, Nancy closes the self locking head gates , and they all happily begin chewing away on the hay. 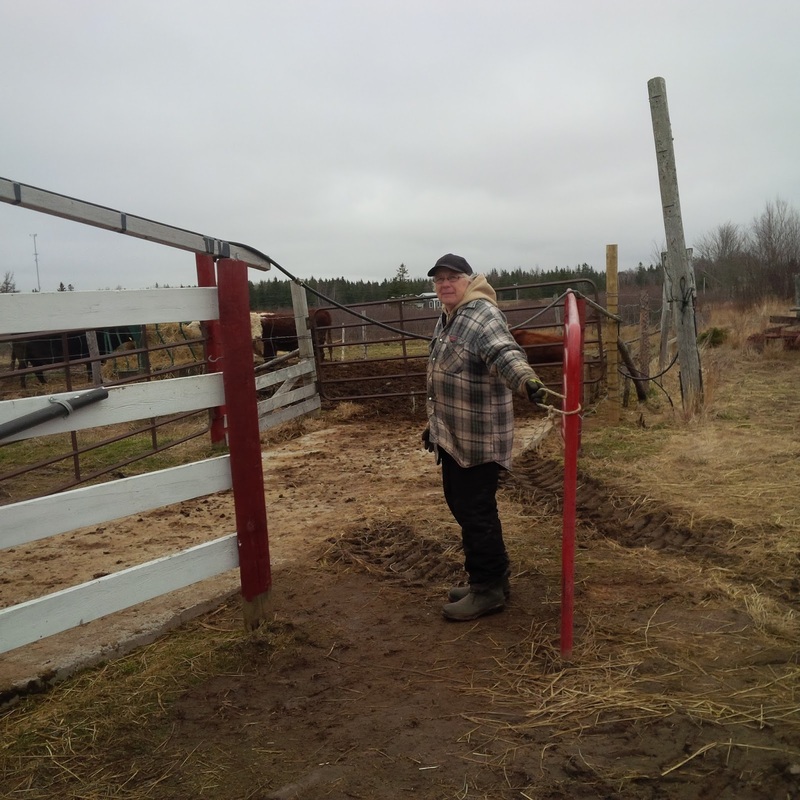 They can lay down and stand quite comfortably in the head gates, which Earl tells me are only used on small farms. This routine she calls, "chores" and it's all done in a matter of 30 minutes. Chickens, cows, everyone settled down for the night. She says, "Goodnight ladies. 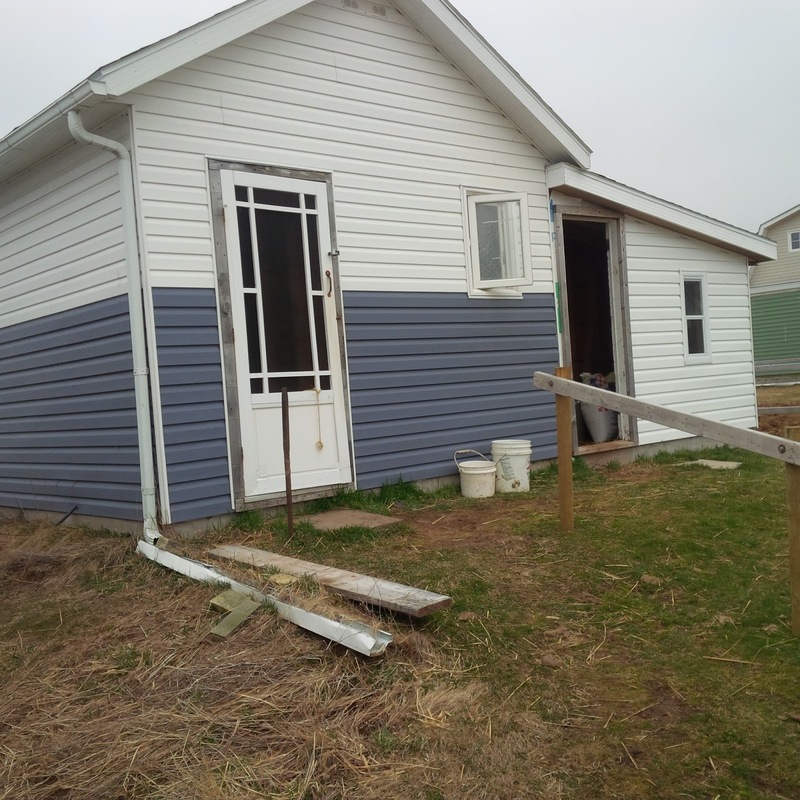 See you in the morning" and closes the barn door for the night. Annette and I were visiting once when I didn't have my camera, but we had so much fun following Nancy on her rounds, I made a date to come back and take photos for my blog. We usually do our egg run together and sometimes stop for a cup of coffee with Nancy and Earl. Annette was away on photo day, but both hailing from the city, we agree that we so love knowing where our eggs come from. This is just another thing that contributes to this wonderful country living. Until next time, hug those you love, eat well and count your blessings. I sure do.